This overlook is a short one-quarter mile walk that runs parallel to Highway 108 right after turning onto Lassen Drive. Cold Springs is at an elevation of 5,600 feet and although it is a gentle climb, the views are spectacular. The geologic formations are most interesting. 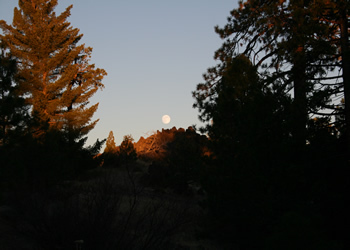 From the Summit Ranger Station, turn left onto Highway 108 and drive for a couple of miles to Lassen Drive, turn left and you will see an area to park just across the road. The trail begins at the point between Old Mono Road and Lassen turnoff on the northeast side. The trail has a slight upgrade and you will come to a volcanic formation at the highest point.